The purpose of this article is to show you how to use Google Adwords to set up adverts that will be seen in the sponsored links area in Google's search engine. Google Adwords gives you a convenient way of driving keyword specific traffic to your site, but for a price. The cost and the amount you pay each day is completely up to you, but you have to understand that the costs can soon build up and you should have a budget set aside for this. Once you have done your keyword research, you’ll know how competitive your terms are and have an estimated cost to get targetted traffic to your website. To start using Google Adwords you first need to create a campaign. To do this, follow the steps below. Sign in with your Google account details. The first time you log in, you’ll have to setup your time zone and currency settings and click on Continue. Now you need to create your first Google Adwords campaign, click the button with the same name. Give your campaign a name and select your country. Click the Manual biding for clicks radio button. Place your daily budget into the box below it. Just put £1 to start off with. That’s it for the moment, click the Save and continue button at the bottom to move on. 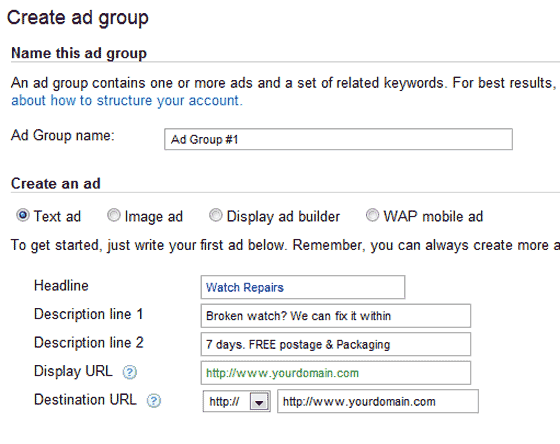 Now you need to create an ad group that can hold multiple adverts. To get started, follow the steps below. Give your Ad Group a name. In the Create an ad section, start to create your text ad. Remember, you don’t have much space so keep it punchy! In the Display URL, it’s best to put the link to your website. In the Destination URL, put the exact path to the page the ad is targeted at. 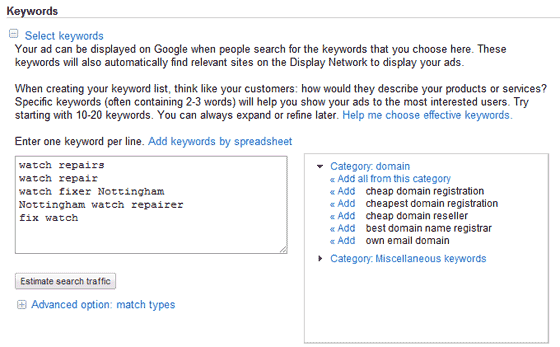 Now in the Keywords section below, place all the keywords from your keyword research, 1 per line. These are the keywords that will activate all the adverts in this ad group. In the final section, Ad group default bids, you need to specify a default bid for all the keywords that you didn't attribute a unique cost per click bid. I would put something like 0.10p here and change it later if necessary. In the Display Network bid box I would also put 0.10p. Display networks are sites where Google thinks your ads would be best suited. Now click on Set up billing later. For this test we just want to setup the adverts rather than make them live. Right, your ad is all setup and is visible on the next screen with all the keywords below it. You can pause any ads from showing at any time by clicking on the green circle and choosing the pause option. If you want to create a new ad, click the Ads tab to the left of the Keywords tab that you are already on and click the New ad button then Text Ad. Enter the details as before and then click the Save ad button. All the keywords have already been entered and will activate the most relevant ad in this group. If you want to create some new adverts with different keywords then you will need to create a new ad group. Before any of your ads are made active, you will have to enter your billing information. This is done in 1 of 2 ways. You change change the default bid at the top of the page by clicking on the Edit button and changing the value. This value will then propagate out to all bids that use the default value. To override a default value on a bid, move across to the Max.CPC column, then scroll down to the keyword you want to change the bid on and click on the value. In the box that appears, type in your new value and click on the Save button. Remember, 10p is written as £0.10. All ads you create are reviewed by Google and automatically put live within a few hours, providing they are approved that is. If you need to change the text of any live ad, then it will be set to under review again until it has been checked and activated again.